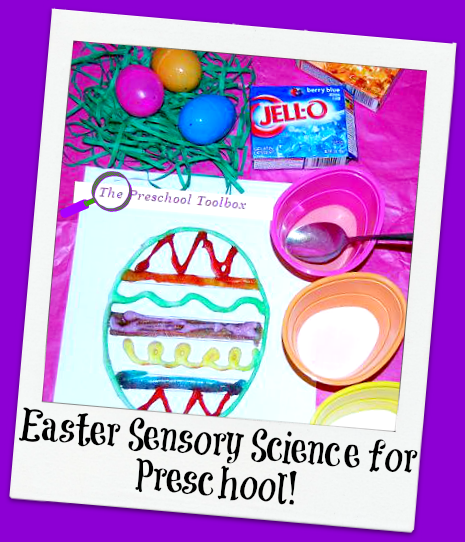 Easter Crafts for Preschool: Sensory Scented Easter Eggs, Bunny Pops, and More! Materials needed: 1 Easter Egg Template per child- Easter Egg Template, one Jell-O® Recording Sheet –Sensory Egg Recording Sheet, crayons or pencils, glue, different flavors of Jell-O®, newspaper or a table covering, cups, and spoons. Protect the table or floor area with a table covering or newsprint. Print the Easter egg template onto heavy paper for each of the children. Pour the dry gelatin into individual cups for the children. Have the children make liquid glue patterns on their Easter eggs. After making the glue patterns, the children can spoon any color/flavor of gelatin onto the glued areas. Have the children gently shake the excess gelatin off their egg and onto the table covering. The children can use as many flavors as they wish (or are available to use). Let the eggs dry thoroughly. When dry, have the children exchange eggs and SMELL each of sections to determine what flavors their peers used for decorating. Assist the children in completing the recording sheet, if desired. Material needed: Lollipop Sticks or craft sticks, large white marshmallows (2 per pop), large pink marshmallows (1 per pop, halved), miniature white marshmallows (one per pop), white chocolate bark, small candy decorations for the eyes and nose, and ribbons. Melt the chocolate bark according to package instructions. Have the children place two white marshmallows on a lollipop or craft stick. The children can cut the pink marshmallow in half (demonstrate how to cut the pink marshmallow or prepare the “ears” prior to the activity.) Have the children dip one end of a miniature marshmallow in the melted chocolate bark and place it on the back or side of the pop as the bunny’s tail. The two pink marshmallow “ears” can also be adhered by dipping the halves into the melted coating before placing on top of the white marshmallows. 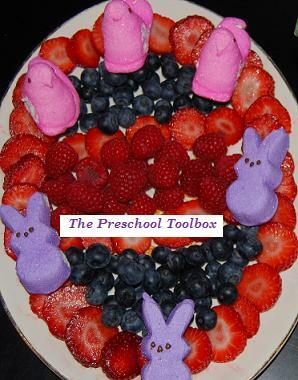 Have the children use candy decorations for the bunny’s nose and eyes. The melted chocolate can be used as “glue” to adhere any candy pieces used for the facial features. *Note: if making in the classroom, the pops can be put inside a large plastic cup for transport home. 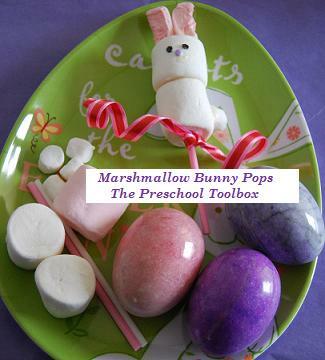 **The pops make a cute Easter party display when placed inside a shallow purple bucket. Put a Styrofoam ring inside the bucket and cover with tissue paper. The bunny pops will stand up when the sticks are poked into the Styrofoam. Easter Egg Fruit Snack Plate – With ALL the candy treats available at Easter, help the children make Easter Egg Fruit Plate for snack. Cut strawberries and make an egg shape on an oval plate. Make strawberry “lines” across the center of the egg. Fill the center with different fruits (raspberries and blueberries are pictured). Serve the fruit with a whole grain muffin and milk for a nutritious snack. For more playful learning, sensory and crafts for Easter, see the Easter Theme via this blog! « St. Patrick’s Day Mini Theme for Kids (Part 3)!